You can edit passwords you have created using the Password Manager. In the working area, right-click the backup or backup copy job and select Edit. At the Storage step of the wizard (for backup job) or Target step of the wizard (for backup copy job), click Advanced. In the Encryption section of the Advanced Setting window, select the Enable backup file encryption check box and click the Manage passwords link. 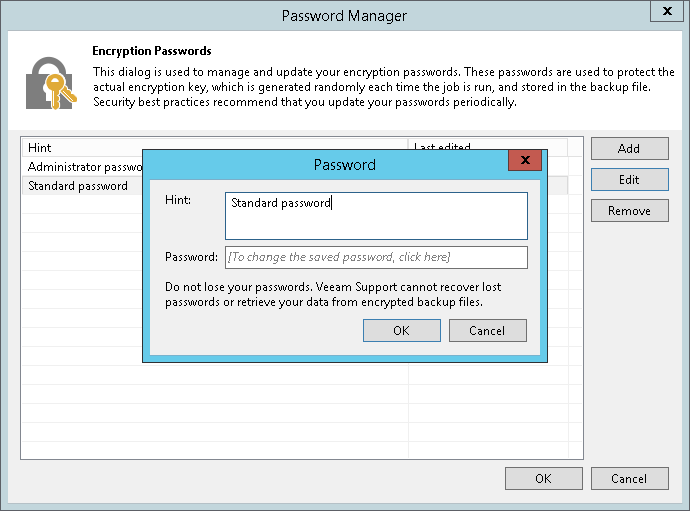 Veeam Backup & Replication will open the Password Manager. In the Password Manager, select the password and click Edit. Edit the password data: hint and password, as required.